Despite having lived for 28 years in the south (18 in Tennessee and nearly 10 in Virginia), I don't feel like a Southerner. Even though I write about food, photograph food and think about food a lot, I don't really feel like a food blogger either. Fraud! Perhaps I'm just not a self-identifier. It was funny, being there. We were all shy, all of us who came alone. I talked with several women about how we assumed that everyone else was supremely self-confident, but really, they were probably all feeling the same way we were. Shy, nervous. Heistant to reach out. Aren't conferences funny things? Aren't groups funny things? I listened to a lot of conversations about SEO and pageviews and selling ad space and sponsorships. What I enjoyed most were the conversations about creating communities. What was clarifying for me is that the conversations about branding and getting my name out there aren't really for me. Do I want more readers? Well, sure I do. But do I want to think in terms of leveraging myself and promoting my brand? Eh, not really. Not when it comes to the blog, at least. I do want to tend to this space (And trust me, it needs some attention these days. I'm on it, I promise! ), but I realized that for SPL at least, I want it to more of a space to gather my friends together than a way to get my name out. It was a clarifying weekend. I want to write and take pictures of the things that interest me and the things I love without worrying if they fit in with my marketing scheme. It may not take my blog far, but it'll keep me happy. Don't get me wrong, I had a great time at FoodBlogSouth, and I'll likely go back next year. I loved hearing the stories behind food and communities, and I loved talking with people about what I always talk here about: how food connects us all. But. For me really, it was and always is, about the photography. I realized, standing in Helene and Tami's workshop, that really what I should be be signing up for are more photography conferences and workshops. Good to know. Helene's workshop in Charleston quite literally changed my life, and I need to be doing more to tend to my craft, either here on my own in the studio or abroad with other teachers. Something to look forward to. And I was reminded that every time I get behind the camera to take a picture of anything, but especially, especially food, I feel like I am sinking back into my skin. It's time I did a better job of honoring that. I've felt stuck for awhile, and this past weekend, I might have come a little unstuck. Seeing Helene, and being reminded of her faith in me, can do that to a person. I have some thoughts about some of the next steps I need to take, but really, really. Where do I go from here? Oh, and I'm guessing you want to know about the food! 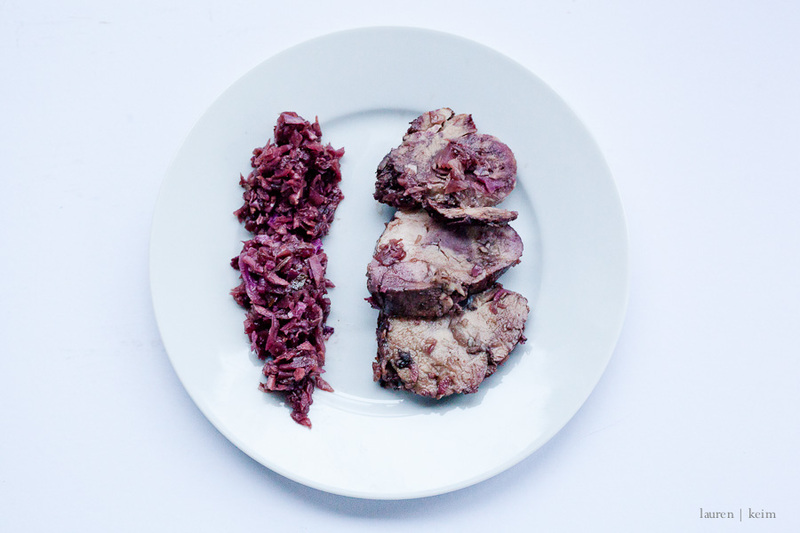 The pork and cabbage were what we served at our Supper Club a few weeks back. I'm hoping to have that post up this week, and I'll definitely make that dish again. It's from Dinner, a Love Story, and definitely a keeper.